Would you like a collection of Ranger Nick's favourite camp oven recipes and read about this Bushy's real life events that lead him to these simple, yummy and hearty meals? Well, his first book is published, containing mouthwatering camp oven recipes plus humorous bush and life tales. He dedicated it to his parents with his father's quote of "You should be walking with me when I am walking by myself". You will be in for a treat, reading this unique book, written in Ranger Nick's own unique style and sense of humour. It is entertaining, informative and a must have companion for any outdoor enthusiast. More than just a cook book, the "Boy from the Bush" makes a great gift for yourself or loved ones. Having come up through the ranks in the Scouting Association, techniques and recipes are all about being prepared and keeping things simple. The simple traditional recipes can be generated in any kitchen, and are loved by young and old, making camp oven cooking a breeze. A selection of entrees, mains and desserts. The book is written in colloquial language, and for those unfamiliar with Aussie slang, there is a glossary in the back. Be amongst the first to acquire Ranger Nick's recipe book with a twist. Looking foward to reading the latest book by Ranger Nick. Look people if you don't have one, your lost without it. SO GET AND BUY ONE, He’s that good he will show how to turn the rock into broth..... - S.J. 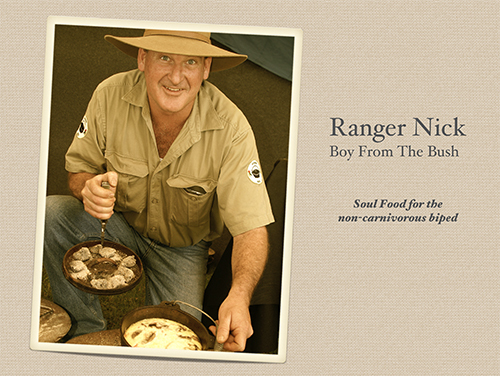 Boy from the Bush - "Soul Food for the non-carnivorous biped"
Ranger Nick's second book is hot off the press. Do you eat vegetables with your meat? Then you're in for a treat. Due to numerous requests from non-carnivorous bipeds, this camp oven cook book came to life offering simple and healthy tucker without flesh as a basis of the meal. Great tasting fresh produce has become an important part of good well-being and a simple healthy lifestyle. Filled with good old fashioned nutrition, the recipes are easy, delicious and "stop the worms from biting". From entrees, main meals and desserts, you will even find gluten free and dairy free meals in there. For the novice camp oven cook, there are tips on heat source, heat control, curing, caring and storing of your camp oven. 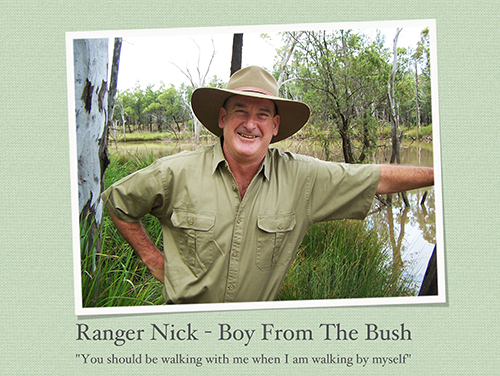 Of course, Ranger Nick has once again added his unique sense of humour in form of bush poetry and has written the book in a colloquial language with a glossary in the back for those unfamiliar with the Australian slang. True to his style, this is yet another unique and unusual piece of art, which is hard to fit into the average book categories. It inspires all outdoor enthusiasts, male and female, young and old and everyone in between. I have downloaded both books and use the recipes as often as I can - I met Ranger Nick at last years Camp Kitchen Cookout at Milmerran- his shows were fantastic and most helpful (and pretty damn funny) so if you ever get the chance to see him go for it - my camp cooking "mantra" now is "+2 -2"
Serious about wanting to learn camp oven cooking? Here's a dinkum guide to basic camp oven cooking techniques. Ranger Nick, the "Master of keeping it simple", shares proven tips, tools and tactics with an open invitation to anyone wanting to learn camp oven cooking but can't get started. The DVD not only includes a couple of Ranger Nick's favourite recipes, but also covers firewood, heat control, charcoal briquettes and cleaning of your camp oven. 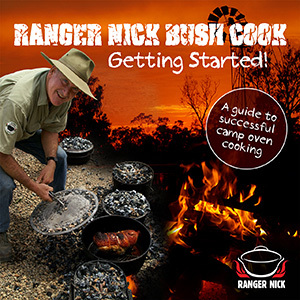 Of course, Ranger Nick presents this educational DVD in his entertaining and humerous style, enlightening you to the joy and ease of camp oven cooking. "G'day Ranger Nick, well I gotta say 2 thumbs up for effort, the info in the dvd will certainly improve my efforts at the next camp fire. Thanks mate for a cracker job well worth the wait, learnt a lot." - N.S. 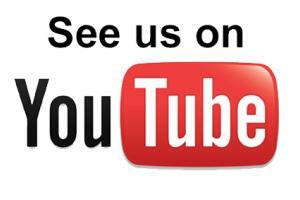 For book signing event details, check out the events calendar.